"The Art and Science of Paranormal Investigation" picks up where “How to Become a Successful Paranormal Group”, the first book in this series, left off. This book is geared toward those who know the basics beyond what is portrayed on television and the internet and this next chapter takes a step forward into the world of client centered paranormal investigations. Learn the art of the interview including basic body language that can help in interviews as well as everyday situations. Learn advanced interview techniques that are simple to use that will help your client remember the most detail and provide you with an accurate picture of your upcoming investigation of the location. Evidence review, and other topics that are rarely mentioned with investigations, are discussed tool by tool. Learn the reality behind the tools and methods used in the field of paranormal investigation that goes against the popular ways of doing things. The above is from the back cover of the book and serves as the general description. It's actually my third book, but the second book ("Betty's Ghost: A Guide to Paranormal Investigation") was a companion written for the first book since I was unable to put that content into the first book. The problem for me is that I publish these books through a print on demand company. While this cuts out a lot of hands, time and expenses, it actually drives the cost of a single book up. My first book was a slender 135 pages, which I had to thin out to that size to keep the overall cost of the book to under $20 and still make a little money. The good news is since the costs of doing business for a print on demand company have gone down over the past two years I have been able to put a bit more content into a book for a much more affordable price. The first book is available at most online book stores, but this new release won't hit the virtual book shelves for a few weeks or months, but it is available (along with my other two titles) at Lulu. However, the best deal to get my book without the middle man is from me directly. I'll be at the Ohio Paranormal Convention in August and the Other Side Symposium in November (and hopefully another library tour in between). My passion for writing these books comes from my frustration felt about the direction in this field years ago as well as my natural urge to want to pass on what I know by teaching others. I have been at my wits end in years past and was told by others in this field to either quit complaining or do something about it, I decided to do both! My overall goal with these books is to help raise the bar when it comes to the average paranormal group and get groups to understand the difference between having fun, being scientific, as well as helping a client and releasing the urge to "be a part of" the investigation. Along with this, I hope to educate groups and individuals on what science really is, as well as other skills that they won't learn on television, and ultimately pass on some of the knowledge, skills, and resources I have gained in my time in this field. When it's all said and done, I can leave a lasting mark on the paranormal field and culture whether I actually accomplish anything of scientific, or other value, in the field or not. As posted in the dedication; a tip of the hat to Doug Kelley and everyone here at ParaNexus. Congratulations on your second book! I'm in the process of reading it and it contains some great info! 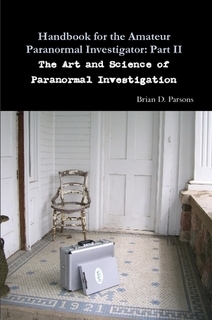 In Handbook for the Amateur Paranormal Investigator: Part II —The Art and Science of Paranormal Investigation, Brian Parsons establishes a refreshingly grounded approach to conducting paranormal investigations including many uncommon and valuable tips that can only come from someone with many years of experience in the field. Any paranormal investigator who reads this book will undoubtedly take away a wealth of knowledge that will enhance and complement their investigations and research. I highly recommend Brian’s book to both new and seasoned paranormal investigators alike. Excellent! ParaNexus Anomalous Research Association, Inc. Awesome. Thanks Doug, that means a lot coming from you! Page created in 0.074 seconds with 141 queries.